King of Portugal (1357-67). This monarch, whose motto was "What the soul is to the body, justice is to the state and to society," was a model of justice, at least in his attitude toward the Jews. Two youths of noble blood who had been in his service a long time had robbed a Jewish pedler out of hate and had then treacherously murdered him. Brought before the king, the murderers acknowledged the deed. The king reflected with sorrow onthe many years of service which they had rendered him; but, in spite of the intercession of certain nobles who held that such men should not be executed for the sake of a peddling Jew, the king pronounced sentence of death, and the youths were beheaded. The king defended the Jews of Coimbra who, when certain of the clergy had invaded their Juderia to beg for eggs and had broken into the house of a Jew, drove the ecclesiastics out of the Juderia. 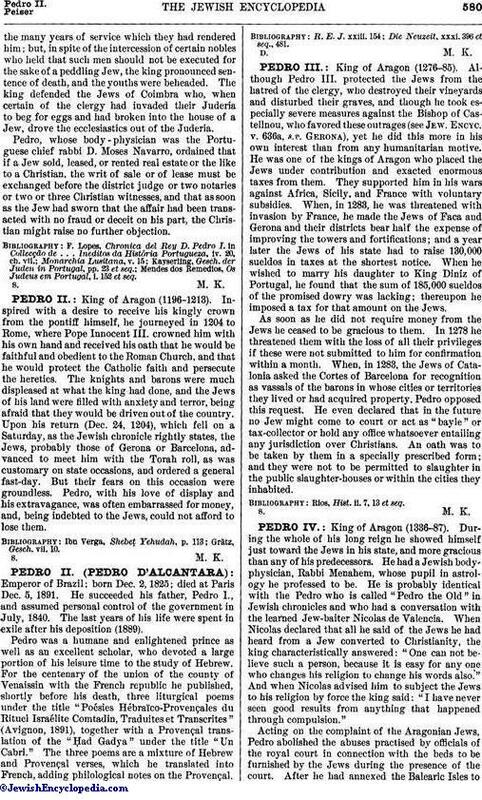 Pedro, whose body - physician was the Portuguese chief rabbi D. Moses Navarro, ordained that if a Jew sold, leased, or rented real estate or the like to a Christian, the writ of sale or of lease must be exchanged before the district judge or two notaries or two or three Christian witnesses, and that as soon as the Jew had sworn that the affair had been transacted with no fraud or deceit on his part, the Christian might raise no further objection. Mendes dos Remedios, Os Judeus em Portugal, i. 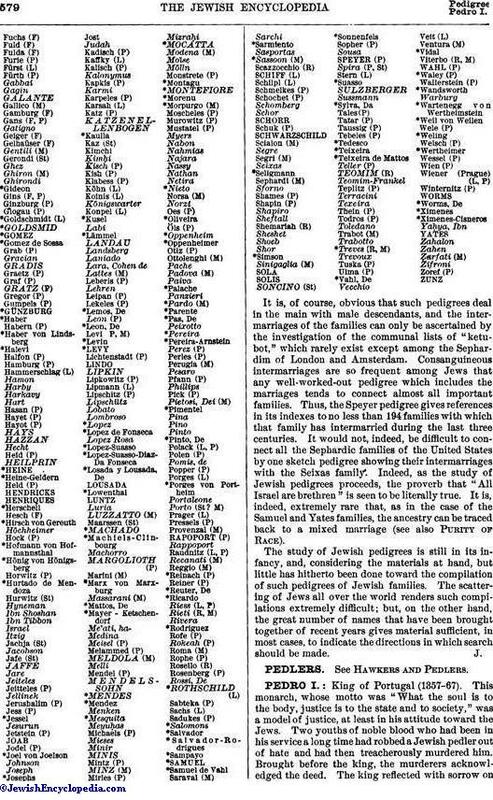 152 et seq.